For families it is often the games you least expect to be a big hit that get played more than any other. While I liked the look of Mario & Sonic at the Rio 2016 Olympic Games I wasn't expecting it to turn into my family's go-to game this month. There are a few factors here that make it a great fit for us. First of all you can play as your Mii character, always a sure fire way to grab the kids' attention. They spend hours honing their on-screen persona and seeing them trot out onto the track is both fun and comical. It's all the more funny because of the outfit mechanic of the game. As you progress you earn points to purchase different clothes, hats and suits. These give you different stat boosts in the game but we mainly enjoy them because how funny they look. In fact, I've caught them on my profile dressing my Mii up in different sporting clobber and then being in fits of laughter. Something about seeing their dad in a leotard or tight-fitting running outfit seems to be irresistibly funny. Another big bonus in the game is that with a single copy you can play up to four players. There aren't enough games that makes use of this Download Play feature in my opinion and here it makes a massive difference. Playing the different events together adds a completely different feel to the game in the family. Not only is it nice to take on a human opponent, but we've gravitated towards certain events that have become regular family battlegrounds. Archery, Swimming and BMX have both stood out in this regard as modes we've gone back to again and again. The kids will go away and practice and then challenge me to a show down. I'm struggling to keep up, with I think they like too. 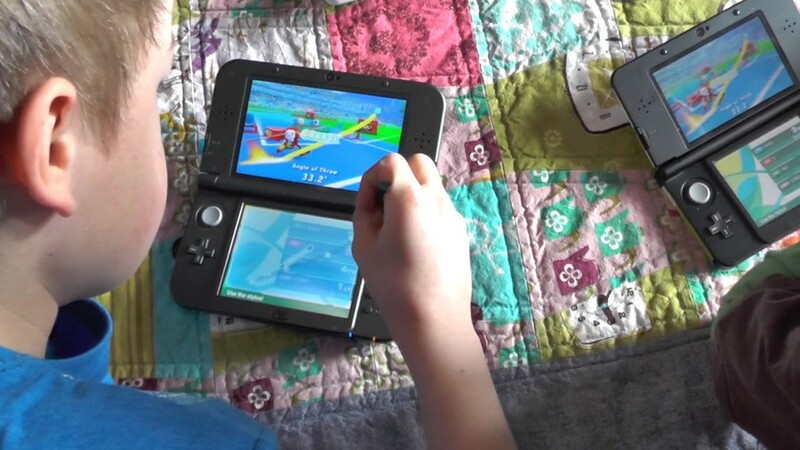 As is the case with Mario Kart 7 and Tri Force Heroes, without Download Play we simply wouldn't be able to do this. I couldn't afford to buy them a copy of the game each, so this is a super feature in my book. As a parent I also like the Pocket Marathon mode. This encourages the kids to get out and about and take their 3DS with them. Much more than step counter it sets different active challenges within a certain time limit. This has worked well as they have now got locked in to walking the full marathon distance set by the game. Along with getting fitter I think this also gives them a better appreciation of the distances that Olympic athletes take on in the track and field events. While I know that Mario & Sonic at the Rio 2016 Olympic Games isn't perfect, the combination of these features — the Mii dress-up, the Download Play and the Pocket Marathon — have made this one of my family's favourite games of the year so far. When's the review gonna happen? When he gets the game off his kids! Sold! Download play with my son and daughter will be a treat. They're both big Sonic and Mario fans so this will make an excellent gift. If only they didn't limit each sport to a few characters. Sure hope the other newcomers are available on the WiiU Version, too. We're big fans of download play in my house. Luigi's Mansion and Mario Kart 7 are our go to games for multiplayer fun on the 3DS systems. I remember the London 2012 3DS game had broken, insurmountable difficulty like mad. let's hope they've toned it down, if only for the kids.